This picture makes me happy. I took it last Thanksgiving when I was in the Blue Ridge Mountains taking pictures of everything. Why? Because my novel takes place in the Blue Ridge on Thanksgiving–my novel that’s coming out any minute now. GOING TO SOLACE. That’s the name. 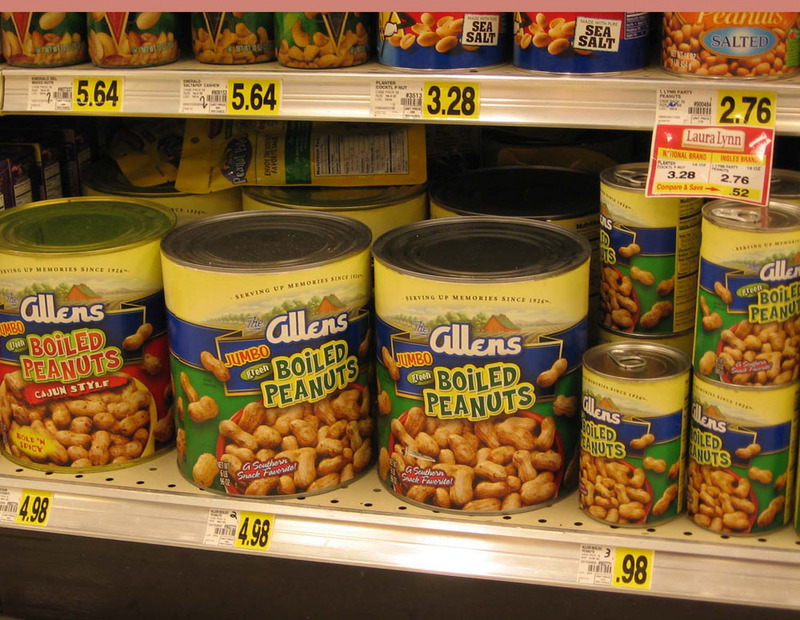 It features boiled peanuts and lo and behold there they were, a whole shelf-full at the local grocery store which is called Ingles (pronounced, in the region, “Ing-gulls” after the family that founded it, though my father always gave it a Spanish pronunciation, “Eeng-glace,” as if referring to the language I’m using here…) But back to the peanuts. Folks really do eat them in that neck of the woods. In fact, they love them. Lord knows, my mama did. Because her mama did. Trust me, they’re squishy and weird. If you grew up with them on your plate, you’re fine. If not, order yourself some hush puppies and call it good. This entry was posted in Family, Going to Solace, Home, LIFE, PAGE, Small Towns, The Little Things and tagged Appalachia, Blue Ridge Mountains, caretaker, family, fiction, Hospice, literary, North Carolina, novel, South, Southern, women, writing. Bookmark the permalink. a.k.a “goobers”, hence the slur applied to the poor farmers who raised them. You can look it up! Memory lane, right bro? I can put myself right back in the back of the station wagon with the dogs and the comic books and the chewing gum on that last leg we’d have to drive before US 40. 13 hours! And of course Stuckey’s. Great stuff. Can’t say I am either. On the other hand, I remember roasting our own fresh peanuts in the oven. Now THAT was good.